Sometimes, you just have to be optimistic, says Obsidian. Obsidian Entertainment CEO Feargus Urquhart says that the studio wouldn't mind getting back into the old spy game and making another Alpha Protocol title. Urquhart feels that there are some good things in the first game, but that there is also room for improvement. Alpha Protocol was a third-person "espionage RPG," published by Sega. It was originally scheduled to come out in October 2009, but was pushed back to May/June 2010, amidst rumors the game was too hard and the RPG side was underdeveloped. When the game finally came out, it received very mixed reviews and sold rather poorly. Sega confirmed in July of last year that it would not be publishing a sequel. 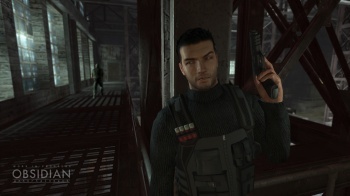 Urquhart said that there were things in Alpha Protocol that either needed more work, or taking back to the drawing board. He admitted that the first game's cover system hadn't been amazing, and that there had been some discussion about whether the hypothetical sequel would be better off without one, leaving the team to focus on other elements. "There were certain things we did really well," he said. "The whole story, the characters, the branching." Urquhart seemed upbeat about the experience, however. "To do a job like this, sometimes you have to be optimistic," he said. "You have to look to the future and say 'We can do better." He also mused that some of the mixed reaction that the game received from critics was the result of a breakdown in communication. "Perhaps it was not necessarily the job we did but there was something beyond the game," he said. "How it was represented or how it was sold or what people felt we promised them. Something went off-kilter there." Unfortunately for Urquhart, the message from reviewers seems to be pretty clear: Alpha Protocol had broken, buggy gameplay and needed more development time. If Obsidian ever gets the opportunity to make another Alpha Protocol - and hopefully it will, because even with all the bugs, there was a lot to like about the game's RPG side -it's going to need a lot more polish than the first one received.